Crack the sun cream out!! What an awesome week it’s been so far, all three groups from Earls Barton, Roborough and Mid Sussex have been incredibly busy and some of the activities have been really good fun, with of course the sunshine helping a great deal of courseeeeee! Earls Barton Scouts have had a packed three days starting on Monday with the overnight hikes to the Ueschinenhutte 700 metres above the campsite. This was followed by the Three Valleys Hike from the hut to the Sunnbuel Cable Car which included a long days hiking which was apparently well worth it and that sounded like a really good laugh. Today the scouts and explorers (‘splorers is the proper name) took the Kisc Eiger Trail trip up to the Jungfrau where the views were absolutely stunning and not a cloud was to be seen! 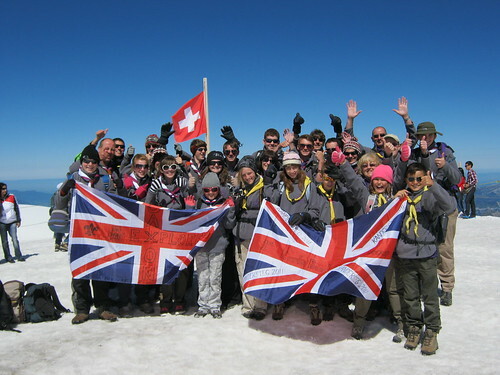 While up on the glacier, 5 scouts or explorers were invested in the amazing surroundings making for a really special day and something they’ll remember for a very long time. The walk followed this from Kleine Scheidegg down to Grindlewald passed the North Face of the Eiger which never ceases to amaze! Meanwhile, Roborough Scouts have had a tiring few days including the early morning today to watch the sunrise at the top of the Allmenalp cable car. Fortunately I managed to escape the 3am start, which would have been well worth it for the fantastic views over the stereotypically Swiss village. Oeschinensee the day before preceded the dawn hike, which of course meant the freezing dip in the Glacial Lake for the daring explorers! The thrilling toboggan run and the chilly lake also kicked off the week for Inferno Explorers, ‘a funny bunch from down south’ would be an apt way to describe them. Having said that they are a really fun group and having spent two days with them I can tell they’re making the most of their week. The challenging Lotchenpass hike followed on Tuesday with the Explorers hiking 1300m up the mountainside from the Gasterntal valley to the Lotchen Glacier. The hut is located at 2600m, which makes a perfect lunch spot and viewpoint over the Swiss Alps! It’s a walk I would recommend to anyone. Today saw the group go on the Chocolate and Cheese trip, taking a tour of the Chocolate museum and tasting authentic Swiss chocolate which according to the connoisseurs tastes a lot sweeter than the English stuff! Two more busy days left including another Jungfrau trip and a good sunshine forecast means that the end to the week should be fantastic! !